Twenty years ago in my book Out of Control I wrote about Richard Dawkin’s Blind Watchmaker software program which allowed users to breed stick insects and other “biomorphs”. The forms evolve through selective breeding. The point of the program was to demonstrate how relatively complex forms could be quickly evolved with a few simple rules. Several artists followed Dawkin’s lead and developed programs to breed art. 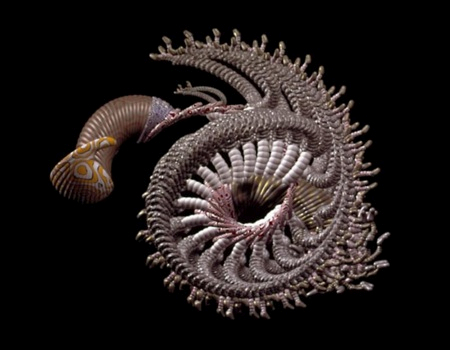 One was William Latham. While I was very interested in evolving artificial creations back then, I was particularly interested in having a swarm of evolvers do it. I had chance to try this out this approach from an unlikely source. Absolut Vodka sponsored my first website in 1994 in the very early days of the web. It was actually their first website for the company, and part of an ad campaign (I even had my own Absolut ad called Absolut Kelly). The Absolut Kelly website was focused my recently published Out of Control, which at great length discussed the hive mind and emergence and decentralized being. Absolut funded a web version of a selected breeding program that Jeffrey Ventrella wrote for me. 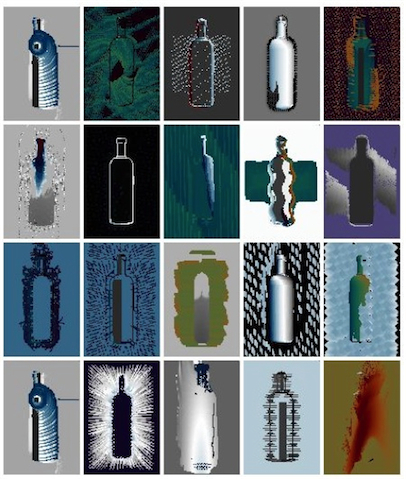 Rather than cultivating a particular form, it would breed abstract forms of the Absolut bottle, whose outline alone was instantly recognizable. The idea was that anyone on the web could at any time breed something new, and improve what someone else had done. The hive mind would evolve the art. I remember how cool that was, when they were not so many folks using the web, to come back a day later and see how the forms had evolved from collective group effort. All this was brought to mind because last month two webs sites, Mutating Pictures and Face Maker, launched tools that selectively mutate shapes generated by an algorithm into human faces. The computer throws up on the screen an array of random shapes. Web users then rate the random shapes from 1 to 10 on “how much this shape looks like a face,” or pick the better of two face images. The winning selections are evolved further by random mutations and more votes from users until a face like the one below begins to take shape. As the audience continues to vote, the face continues to be refined. In this case users spontaneously began to select a face of a samurai — perhaps in response to a famous legend about crab fishers in the Sea of Japan. One of the most famous ballads sung by classic musicians in Japan is the sad true story of the Heike clan. Unlike most ballads, this one tells the tale from the losing side. In a final great sea battle in 1185, all the warriors of the Heike clan were destroyed by the Genji clan, and their bodies left to rot in the sea. 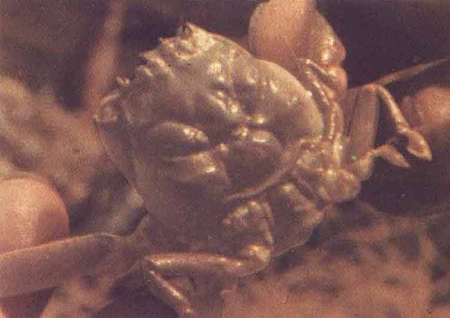 Today we can find crabs whose carapace looks remarkably like a Heike samurai warrior. In his book Cosmos Carl Sagan hypothesized that local fisherman, hauling crabs with a vaguely human face on them, believed they contained the souls of the departed warriors and threw them back, while eating the less face-y ones. Surviving crabs randomly produced more and less face like bodies. 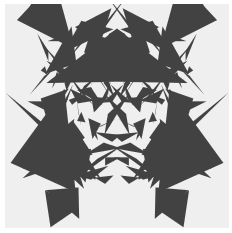 The more the crab’s random patterns looked like a samurai face, the more certainly they were thrown back to breed. Over centuries, this selective breeding evolved a recognizable face, as surely as the face mutator does. Sagan probably first heard the story from a 1952 Life Magazine story written by Julian Huxley, an evolutionary biologist, and according to many observers, such as Bradley Rhodes, it isn’t true. 1. Many crabs look like human faces, whether or not they are from the Sea of Japan or in regularly fished waters. The grooves that make the outline of the face are caused by supportive ridges that serve as sites for muscle attachments. 2. Fossils of crabs closely related to the samurai crab also resemble human faces, even though they predate man’s appearance on earth. 3. Most damning of all, the fishermen who make their living from the Sea of Japan don’t eat any of the samurai crab regardless of what they look like: they don’t grow any bigger than 1.2 inches across the back, so fishermen always just throw them back (or rather, they never bother to retrieve them from their nets in the first place). However, while the Heike face samurai crabs may not have been selectively bred, it doesn’t take away from the power of the face mutator. And just like in biological evolution, or known animal breeding, many uncooperating selectors can still breed in a unified direction. If you take some of the selected samurai face winners and overlay them you get an averaged face which looks like stunningly painterly. 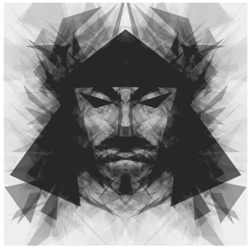 It is an emergent face, drawn by no one and everyone at once. At the moment the tools of exploratory evolution restrict an artist to begin with a random or primitive start. The next advance in evolutionism is to be able to begin with a human-designed pattern and then arbitrarily breed from there. Ideally, you would like to be able to pick up, say, a colorful logo or label that needed work (or mind-altering modification) and progressively evolve from that. The outlines of such a commercial software are pretty clear. Will Wright, SimCity author and founder of Maxis, the innovative software publisher behind El-Fish, even came up with the perfect jazzy title: DarwinDraw. In DarwinDraw you sketch a new corporate logo. Every line, curve, dot, or paint stroke of the image you create is rendered into mathematical functions. When you are done, you have a logo on a screen and a mutable set of functions as genes in the computer. Then you breed the logo. You let it evolve outlandish designs you could never have thought of, in detail you don’t have time to do. You jump around randomly at first, just to brainstorm. Then you hone in on an unusual and striking arrangement. You turn the mutation rate down, use multiple marriages and antiparenting to fine-tune it to its final version. You now have an obsessively detailed evolved artwork with cross-hatching and filigrees you wouldn’t believe. Because the image is based on algorithms, it has infinite resolution; you can blow it up as large as you like with unexpected detail to spare. Print it! We are still not close to this. No Photoshop or Illustrator or Final Cut plugins which will let you grab and image and directly evolve it, specifying a direction of the evolution. You keep generating variants until you have a population of designs you like. Still not yet. But as the samurai above show, Someday.